Today’s Guest Hoyden is whoozqueen. Whoozqueen blogs at “Oohsome: Ooh, I’ve Got Something to Show You!”. Whoozqueen is a 39 year old crafter, gamer and rampant netizen, with a keen eye for the handmade and unusual. If she’s not roaming Azeroth, she’s playing with her puss, Monty, or taking photos. I watched the “Need for Speed” segment start on Thursday’s Sunrise program, and I must admit, my expectations were low. 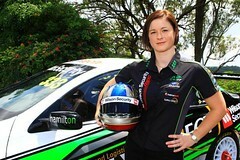 Unfortunately, the profile on Australia’s leading female motorsports competitor was dismal. By the time it was over, I was bloody furious. I hadn’t learnt anything about Leanne Tander and her apparently thriving career on the track in a highly competitive sport. What I had learned was that women in motorsport aren’t taken seriously. Hokey jokes about women drivers? check. Asking if she would give up her place in the race for her husband’s benefit (like a good woman should?) check. Male reporter who needed to prove that OMG HE CAN DRIVE TOO…AND WHAT’S MORE, PARK. CHECK CHECK half the frickin’ footage CHECK. Where were the questions about her skills, previous wins, what the sport entails? What’s the difference between Formula 3 and her previous category of driving? Why did they go for a gentle spin in a non-racing sedan, when they could have used footage from Leanne’s races, or created footage of her driving faster than the average person does on the way to the supermarket. Why on earth did Barretts feel the need to drive during that segment? Putting the woman back in the passenger seat where she belongs? Some weird ego thing? I wasn’t watching to see some middle-aged patronising reporter drive, I wanted to see what Leanne could do. I wanted to learn something, to feel positive about Leanne’s experiences as a driver, and ended up disappointed with the lazy, patronising whee-lookitme approach. Mel: …and she’ll make her Bathurst 1000 racing debut later this year, but to make things even more exciting, she’s up against her husband, Garth. Well, Barretts spent some time with Leanne, behind the wheel. Barretts: [in the front passenger seat] Leanne, congratulations. What does it mean to you to be racing the Enduros? Tander: [behind the wheel] There’s so many people out there who would love to have this opportunity. So for me to get it, I just – yeah. I’m just really really excited. Barretts: Do you feel like you’re carrying the flag for girl power, or do you just feel like another racecar driver? Tander: To be honest, from my point of view, yes – I’m just another driver. But for all the girls out there that are sort of coming through the ranks, and there are quite a few of them, I think by getting out there and racing at Bathurst, they’ll have something to strive for in their own careers. Barretts: Alright, what about this. Hypothetically. There’s you and Garth coming to the line at the Bathurst 1000. Is there anything set up where you will let him win? Barretts: [laughs] From your experience on the road, who are the better drivers, men or women? Tander: [laughs] I don’t think I’ll be drawn on that. I think there are different areas that men are better, and there’s different areas that women are better. Barretts: So what did you think of my driving? Tander: At the moment. But we’re only going in a straight line. Barretts: I think you’d be a bit impressed? Tander: [dubious] Yeah? Quite possibly. Barretts: You might want to push my name forward to the team. I like to indicate a fair way out. Tander: Yeah, we don’t usually indicate on the racetrack. Barretts: Do you – um – can you sense a bit of a racer? Just waiting to be uncuffed? Tander: Perhaps. But I think you should probably move your hands down a little bit. Barretts: Well Leanne, thanks for your time. We wish you all the best for the Enduro races. And it’s actually probably a good thing that I’m driving, because we just have to do a little park in here. It’s probably better if I do it. How am I going? Tander: [playing along to obvious set-up] Watch out, I think that car’s a bit close back there. Barretts: What’s that beeping noise? Tander: I think that means you’re going to hit something. Barretts: Oh, no, don’t worry about that. * Cut back to studio with Mel and Kochie. Mel: [laughs] What a goose! Barretts: Nah, she went straight in! But I’ve gotta say, she is a remarkable young lady. You know it’s not easy for a woman in the sport of V8 supercar racing. She’s really had to earn her stripes, and she’s done that. And she knows. She sits in the garage watching Garth race, and she knows that she can cut her way against that field, she knows that she’s competed against a lot of those guys when they were younger, and she could probably beat a few of them right now. Kochie: She is just fantastic. Good on ‘er. We’re going to follow her. Barretts: Yeah, and a great stage for her, exactly right. Look, keep an eye out for her, Phillip Island and Bathurst, um – I think she’ll be a rising star. And hopefully she’ll be full-time soon. Kochie: She’s gonna be our team, I reckon. Kochie: [talking over Mel] Ohhh. Look at the time. I’ts half past seven. Alright, thankyou Barretts, news time now. Not only driving… BUT PARKING, TOO? Why was only 50% of the segment ostensibly about her focused on this? Clearly his manly parking skills are the TRUE STORY, which needs to BE REPORTED! And he is not at all threatened by her. Just so you know. Wow. That was awful and embarassing. Did you write a letter to the program? Because… wow. Oh my, that was cringeworthy. What is it with the whole parking thing? I’ve never really understood that. That plumbs whole new levels of atrocious. Barretts – what a jerk! You know I just can’t imagine that a woman would do that story in that way. @ Anna – I most certainly did. No response as of yet. Doubt that they will (a) understand how bad that segment makes them look, for all their ‘girl power’ remarks and (b) will probably be shot down by Barretts who couldn’t come up with an original story angle if he or his producer tried. Hmm, hey guys, how about taking the angle of ‘great driver trying out new arena of driving, hopes to kick some arse’? That’s just abyssmal. Hardly surprising, but still. Barretts: I think you’d be a bit impressed?Why?